Nothing says serenity and makes you feel like you're at a spa (while still in your own yard) like an outdoor shower. Here Yardzen Pros share the things to consider when adding one to your design plan. The absolute quickest and easiest way to add an outdoor shower is a freestanding one like this beauty from Cambridge Casual ($250). Just hook it up to a garden hose and you're good to go. A downside is that it doesn't have a hot and cold water setting, but at that price maybe it won't matter? If you're set on an installed shower but want to keep costs down and avoid running new plumbing lines (which can get expensive fast), add an outdoor shower where you already have water outside. The most logical place is near an existing external spigot (it's ok if it only has cold water). You'll need a plumber to add hot water. 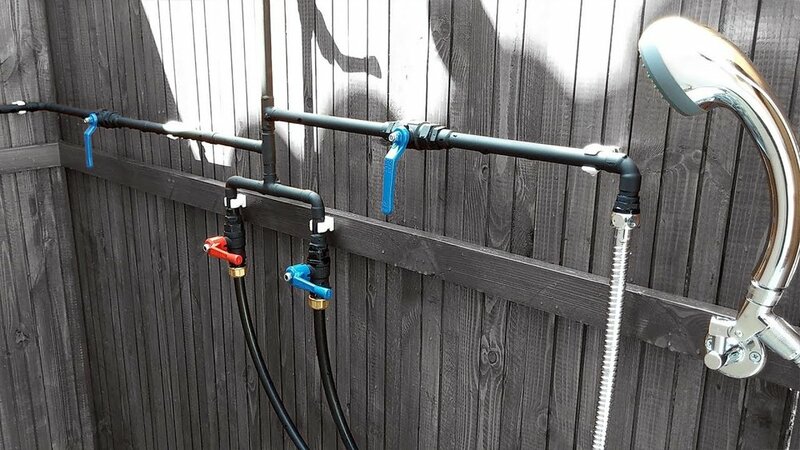 Hire a plumber you trust (or work with your Yardzen concierge to find one) and hook up to the permanent water lines in your house. If possible try to stay as close to an existing hot water source like an interior shower to cut down on the distance your new pipes have to run. If you go this route the world's your oyster. A young family had an underutilized side yard -- a perfect place to add an outdoor shower. Here's the dramatic -- and gorgeous -- transformation.